Dileep Lobo is Professor of Gastrointestinal Surgery at the University of Nottingham and Consultant Hepatopancreaticobiliary Surgeon at Queens Medical Centre, Nottingham, UK. 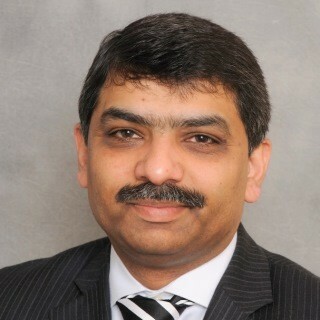 He qualified from Bangalore University, India and has trained as a surgeon in Chandigarh, Nottingham and Leicester. He was awarded a DM degree with distinction by the University of Nottingham for his work on fluid and electrolytes and is a recipient of the Sir David Cuthbertson Medal for his contributions to the field of Nutrition and Metabolism. He has been awarded the prestigious James IV Society of Surgeons Traveller’s Award and the Moynihan Fellowship. His clinical interests focus surgery of the liver, pancreas and biliary tree and laparoscopic surgery. His research interests include surgical nutrition and metabolism, fluid and electrolyte balance and pancreatic cancer. Dileep is the local Special Interest Group Lead in Surgery for the UK Comprehensive Clinical Research Network. He is also the Surgical Lead for the Nottingham Digestive Diseases Centre NIHR Biomedical Research Unit. He was an Associate Editor of the European Journal of Clinical Nutrition from 2007 to 2011 and is currently a member of the editorial boards of the World Journal of Surgery, the World Journal of Gastroenterology and Clinical Science. He has over 130 publications in peer-reviewed journals and has lectured both nationally and internationally. He has been awarded the Fellowship of the American College of Surgeons in 2010 and is a member of the Scientific committees of the European Society for Clinical Nutrition and Metabolism, the Association of Surgeons of Great Britain and Ireland and the International Society for Surgical Metabolism and Nutrition. He is also the Chairman of the Scientific Committee of the ERAS Society and the Director of the Scientific Programme for the Society of Academic and Research Surgery. Is a T-tube necessary after common bile duct exploration? Courvoisier’s Gallbladder: Law or Sign? Non-operative management of uncomplicated acute appendicitis in children: where is the evidence? Are histologically normal appendices normal? Acute appendicitis - a benign disease? Body composition measurement using computed tomography: Does the phase of the scan matter?